I was wowed over by the beautiful and well kept facade of BARBARA'S RESTAURANT located in Intramuros, Manila, Philippines. We walked along the historic streets of the walled city to reach Barbara's Restaurant located along the historical General Luna street in Intramuros. The restaurant evokes the charm and beauty of a bygone era. It is as if we were transported back in time to the Spanish Era in the 16th century. Barbara's Restaurant is just in front of Saint Agustin church and is inside the grandiose Plaza San Luis Complex just beside White Knight Hotel. We went up the intricately-carved staircase and were greeted by magnificent silver-gilted mirrors. When we entered Barbara's restaurant it is as if we stepped into a place reminiscent of old world elegance. We then walked towards the main hall and get seated at the round dining table to experience the luxury of fine dining at its finest. Barbara's Restaurant table settings are very well organized and coordinated. Barbara's Restaurant use tablecloths as part of their table setting complete with folded napkins. I personally considered it much more enjoyable to eat my food on a pleasantly arranged table and Barbara's Restaurant did not fail me. The tableware for this buffet dinner includes soup spoon, entree fork and spoon for dessert (variations exist), side plate, side knife, wine glasses, napkin and a beautiful flower center piece. Barbara's Restaurant has high ceilings and crystal chandeliers the setting is a world-apart from your modern-day shopping mall restaurant. Barbara's Restaurant with a beautiful flower center piece and candle-lit table set. Barbara's Restaurant offers buffet lunches and dinners as well as A la Carte choices. Buffet is only 500 pesos. Not bad for a buffet dinner with one-hour cultural presentation from the in-house student dance group who, I should mention, are very good dancers. Roasted Chicken two thumbs up! The salads are fresh and delicious. Barbara's restaurant lumpia is to die for! I love it! Barbara Restaurant's Linguini Alessandro pasta is delicious. We enjoyed our dinner from 6 p.m. to 10 p.m. while taking in the grace and beauty of traditional Filipino Dance, music and very cozy and warm ambiance @ Barbara's restaurant. The young performers are Barbara's Restaurant scholars. They made the audience cheerful with their exciting fiesta dances like sayaw sa bangko, binasuan, pastores, and the perennial favorite, the tinikling! They even invited some volunteers from the audience to dance w/ them. It was fun to see some volunteers tripping in the tinikling dance. It really added to the fun. Making it a really fantastic night for everyone. The audience were in good spirits. This quintet serenaded us while we were eating dinner. We ought to introduce to another generation the joys of Philippine folk dance. Our folk dances are colorful, vivid and vibrant - alive and exciting, charming and inviting. Barbara's Restaurant staff were all very accommodating and they truly provide a very good service. There was no discrimination at all between the foreigners or Filipino guests. The food were very palatable. The servers always refill the buffet trays. For dessert we ate squares of Brazo de Mercedes, brownies topped with cherry, Café Gelatin con Sago served in wine glasses and banana fritters. For me, the banana with sesame seeds dessert is the best! Everybody love the cultural dance. It was superb! There's no guest in that room that night who is not watching the cultural presentation. Kudos to the dancers especially to the guy who is shouting so loud. He made it more fun @ Barbara's restaurant that night. The Spanish colonial style architecture with live music and cultural presentation every evening and the neighborhood of Intramuros is a little oasis in chaotic Manila. We enjoyed the show tremendously. Barbara's Restaurant is worth a try. See and experience Barbara's Restaurant classic elegance for yourself. This is a Food Write-up entry to the Intramuros Bloggers Challenge 2012 organized by IntramurosManila.Asia. Damn. Superb! I really love your shots! Sobrang nakakainggit ka. Ganda ng napuntahan nyo! Hehe. 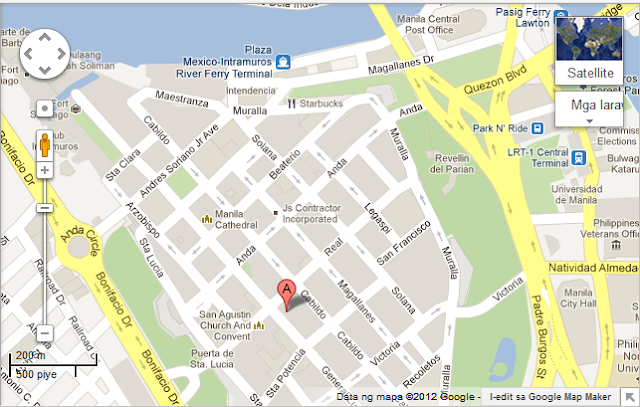 A place to visit when in Intramuros.Good food ,good service,perfect ambiance and affordable price. Hope to get there one day.I love the high ceiling and the chandelier. I've been to Barbara's years ago for an ala carte lunch. I love their callos & lengua. But I never tried their dinner buffet with cultural show. Maybe one of these days with a foreign or balikbayan guest. I think Ensogo or Metrodeal offered a discounted rate for this buffet. Thanks for sharing! This is a MUST see place. Very nice really! I will definitely drop by this place sooner than later! I've been wanting to try Barbara's Buffet for a time now and your post definitely encourage me to go there asap! I'm excited to see the place and to be entertained with the performances. This is something to crave for especially at Valentine's Day. Young and old could find this Spanish antique place like Barbara's Restaurant ideal for recollecting the ancient Spanish era where elegant, grandiose, memorable cultural presentation by talented youth. Spending an affordable dinner at this historical resto is something to be proud of as a Filipino. Went there last October 2011 and their cultural show was one of a kind. I didn't took my camera with me, hence, I wasn't able to write down about our experience. once in a while, my family and i would love to eat somewhere nice. sometimes, we got to barbara's too! great food! Nice place. A lot of people will definitely make reservations to this place on Valentines Day. So, guys better reserve your table now. Fantastic! Great food, ambieance and entertain in one place. Good choice! The place looks fab! Good job. Another Intramuros must-visits! Thank you for sharing this. Ganda naman, sana ma visit ko one time. Wow! I think my parents and grandma would definitely have a great time here. Hope the food won't dissapoint as well! I had dinner here last year a week before Christmas.. Its amazing! Everyone wearing traditional clothes of a different era. I felt I was really on a different time! Too bad for me though, I miss the cultural show. like having your picture taken with the Guardia Sibil! Wow! A very nice review indeed. You're really so good Tita, especially the photos. I love it! I hope me and mommy can visit this place. :) IT LOOKS SPECTACULAR! I've heard a lot about the place but actually never been there. Should be a nice place to bring foreign friends. Very nice and interesting blog Cha. I haven't been to any restaurant of this cultural kind. Thank you for sharing this to us. The photos are great! Looking at it is a feast in the eye. I will definitely go there with Yuki Anne and Kuya IC. Nanghihingi ka pala ng tips regarding this post, sorry ngayun ko lang nabasa hehe. Carl.Napp are you visiting the Philippines again this August? Yes, I believe Barbara's Restaurant is a good alternative to Sofitel. Ha ha ha! Parang seryus =)) pero like ko talaga manalo po :-p! Salamat po sa mag like. God bless us all! Thank you so much to everyone who always visit/ read my blog, and to those people who liked, tweet and shared my post. God Bless us all! What a lovely restaurants is this. This is such a nice restaurant I ever see.